This entry was written by admin, posted on November 4, 2011 at 3:19 pm, filed under Uncategorized. Bookmark the permalink. Follow any comments here with the RSS feed for this post. Post a comment or leave a trackback: Trackback URL. 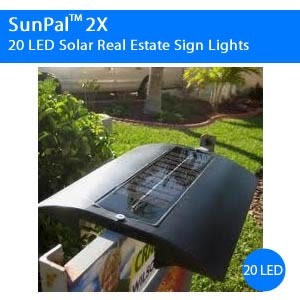 "I’d never thought the SunPal solar light could bring me so many new listings! My sellers really appreciate me going the extra mile to show their house." "If you are looking for an affordable, convenient, and effective marketing tool, the SunPal is the perfect choice for you. In a tough Real Estate Market, having your listing signs illuminated really grabs the attention of potential buyers - leading to quicker sales and more commissions." 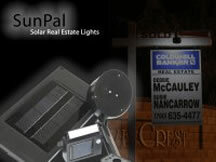 "I started off with one SunPal-4x and now I have 35 lights on all my listings! Thanks for giving me the tools to add more value to my customers." Visit us at the annual and midyear NAR expos this year! Visit our booth for the latest information, specials and new product releases.